fresh vegetables such as kai-lan, carrots, peas, corn, bamboo shoots, etc. The peas may be a replacement for the green onions. Some recipes include Shaoxing wine. Some western Chinese restaurants also use soy sauce to flavor the rice. 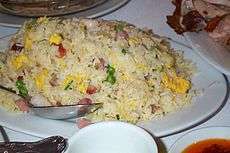 A variant with small pieces of chicken also added is often sold in the UK as special fried rice and in the US as house fried rice. Yangzhou fried rice is a perhaps the most well-known dish of the city of Yangzhou, Jiangsu province. The recipe was invented by Qing China's Yi Bingshou (1754–1815) and the dish was named Yangzhou fried rice since Yi was once the regional magistrate of Yangzhou. It is often served with thousand fish soup. There are two ways of cooking the dish in terms of the preparation of the egg scrambled. The first variation is known as "silver covered gold", in which the egg is scrambled separately before mixing with the rice. The alternative "gold covered silver" method is described as pouring the liquid egg over the rice and vegetables mix and frying the two together. Legend has it that the best cooks of Yangzhou fried rice will create the dish with a rice grain to egg piece ratio of 5:1 or even 3:1. In October 2015, as part of the 2500 years anniversary of the town of Yangzhou, an attempt was made in Yangzhou at beating the previous world record for fried rice set in 2014 by the Turkey culinary federation. The attempt, made by the World Association of Chinese Cuisine resulted in 4,192 kilograms (9,242 lb) of Yangzhou fried rice being produced by a team of 300 cooks in Yangzhou. The organisers initially planned to send the end product to five companies for consumption by their staff. However, about 150 kg of it ended up as pig swill as it had been cooked for four hours and was felt unsuitable for human consumption. As per organisers, the rest was sent to local canteens. However, due to a part of it being sent to feed animals, the world record attempt was disqualified, as a Guinness World Records spokesman said that it had become obvious that the dish was not fit for human consumption. ↑ Yongqi, Hu (27 October 2015). "Yangzhou record for fried rice is revoked". China Daily. Retrieved 29 April 2016. ↑ "Yangzhou stripped of fried rice record after waste scandal". People's Daily Online. Xinhua. 26 October 2015. Retrieved 29 April 2016.